Congress Stops Bickering And Approves $1.1 Billion To Fight Zika : Shots - Health News The deal to fight the mosquito-borne virus came after lawmakers dropped a controversial provision to block payments to Planned Parenthood for women's health care. A health department microbiologist looks for mosquitoes carrying Zika virus in Hutchins, Texas. It brings to an end a partisan fight that has had the unusual effect of delaying funding to deal with what all sides agree is a public health emergency. The delay came out because of disagreement over side issues like funding for Planned Parenthood and whether the money should be considered "emergency" spending. Wednesday's deal drops language barring the money from going to Planned Parenthood clinics. The Senate passed the measure Wednesday afternoon; the House passed it Wednesday night. "Women's health should never be treated like a political football," said Sen. Patty Murray, D-Washington, who is the ranking member of the Senate's Health Education Labor and Pensions Committee. "I am glad that Republicans finally agreed to set aside the extreme provisions that would have specifically blocked Planned Parenthood health care providers from accessing critical funding." 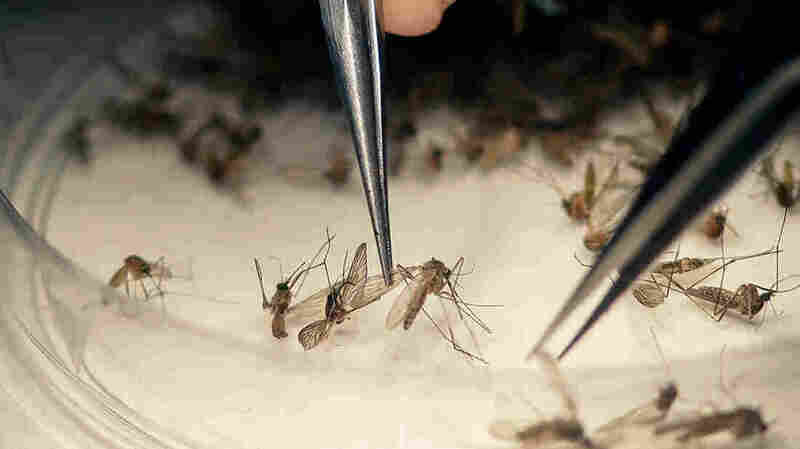 More than 23,000 people in the mainland U.S. and Puerto Rico have contracted the Zika virus, according to the Centers for Disease Control and Prevention. That includes more than 2,000 pregnant women, which is especially troubling because the virus can cause birth defects. The CDC estimates that 20 babies in the mainland U.S. and 1 baby in Puerto Rica have been born with birth defects related to Zika. The Zika virus can cause microcephaly — a condition where a baby's head and brain are undersized and underdeveloped — in as many as 13 percent of babies born to women who get infected while pregnant. It is also linked to several other types of birth defects, and to Guillain-Barre syndrome in adults. The deal reached in Congress includes $394 million to help control Zika-carrying mosquitoes and another $397 million to help develop a vaccine against the virus and better tests to help diagnose cases of Zika. President Obama asked for $1.9 billion in emergency federal funding back in February to fight Zika. The administration has been using money shifted from other accounts, including money that had been specified for studying and fighting Ebola, and for state-level emergency preparedness, to address the Zika threat. Earlier this month Dr. Tom Frieden, director of the Centers for Disease Control and Prevention, warned that his agency would run out of funds to fight Zika by Friday. Health and Human Services Secretary Sylvia Burwell issued a similar warning in August.